This Chive Oil recipe is a preview from Chef Laurent Gras's IACP award-winning cookbook, "My Provence." This flavorful oil is a nice condiment for fish and meat, a good addition to dressings, and can even be substituted for scallion oil in Chinese dishes. Find this Chive Oil in this Fresh Cod with Green Olives recipe. In a blender, combine the olive oil and the chives. 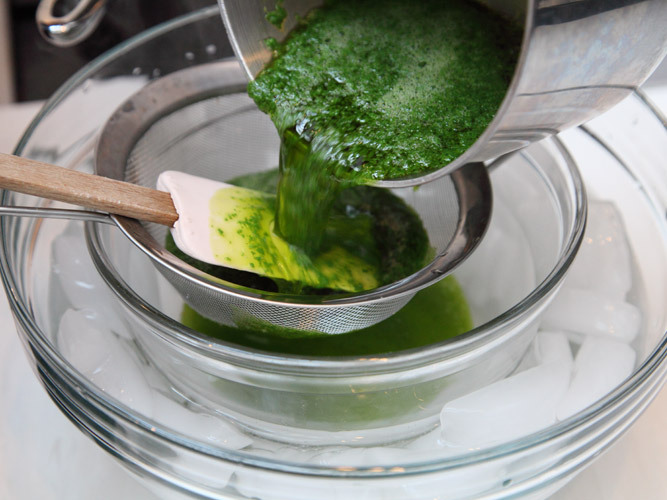 Liquefy the chives, emulsifying them with the oil, until they are totally puréed. Pour this mixture into a small saucepan and set over medium heat until it starts to simmer. At this point, the emulsion will break. Pass the oil through a fine mesh strainer into a small mixing bowl. Place this bowl over another bowl filled with ice water, and stir until it cools. Store the oil in a sealed container in the refrigerator for up to one month.